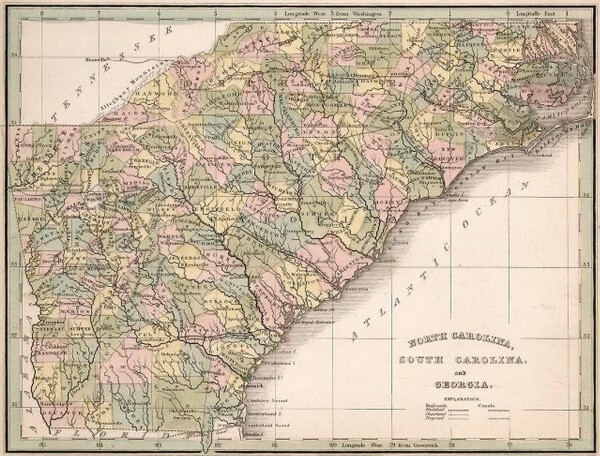 “North Carolina, South Carolina, and Georgia“ was first published in several 1835 atlases, the best known of which is Thomas G. Bradford’s A Comprehensive Atlas Geographical, Historical, and Commercial. The map shows an early network of proposed and chartered railroads crisscrossing the state. Only one railroad is depicted as “Finished”, that being a segment of the Cape Fear & Yadkin Rail Road running from Wilmington to the Cape Fear River near Fayetteville. Northwest of Fayetteville towards Rowan County, the CF&YRR is shown as proposed on this map. 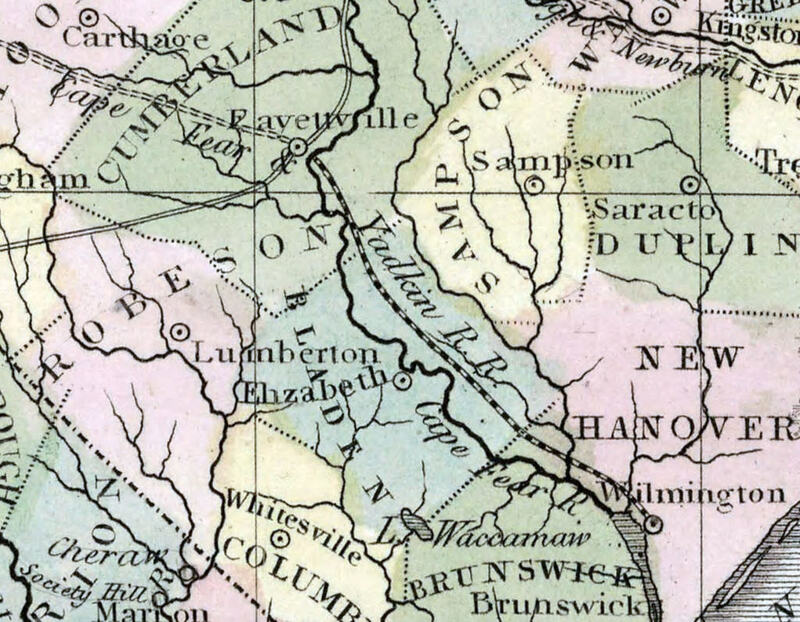 Bradford’s map suggests that the Cape Fear & Yadkin Rail Road was the first of its kind in operation in North Carolina. That was not the case. In James C. Burke’s North Carolina’s First Railroads, a Study in Historical Geography (2008), we learn that the Cape Fear & Yadkin Rail Road was “incorporated during the 1831-32 Session of the General Assembly”, and the books open for subscription in May of 1832. Just one year later, news of the demise of this proposed railroad was published in a Wilmington newspaper, and subscribers were informed that their money would be returned. I suppose one could say it was “Finished” before it ever got started! In 1838, Bradford published another atlas with slightly larger maps. The North Carolina map in that atlas shows only the Wilmington & Weldon and Raleigh & Gaston railroads, the former completed on March 7, 1840, and the latter completed one month later. For those of you who use maps for genealogical or other historical research, this is another excellent example of how maps don’t always reflect reality. For those of you who would like to read more about North Carolina’s railroad history, J.D. Lewis provides extensive coverage on his Carolana web site. There is also a multipart entry in the online version of the North Carolina Encyclopedia. This entry was posted in 19th Century, Map errors, NC Transportation and tagged cape fear & yadkin rail road, north carolina maps, north carolina railroads by crmaps. Bookmark the permalink. Were there ever any construction plans or right of way maps for the Cape Fear & Yadkin valley Railroad? I am a Board member of the Red Springs & Northern RR Foundation. The RSN owns 14 miles of in-place track between Parkton NC and Red Springs, NC. I am researching RR right-of-way (ROW) boundaries. I am particularly interested in establishing how the Cape Fear & Yadkin Valley ROW was purchased, e.g. by “fee simple”, condemned or by easement. Any help would be appreciated. Also interested in the width of the ROW in specific locations. I have tax maps showing an 80 ft. ROW to be common. Many other NC RRs had 100 ft. ROWs. I have absolutely no idea! I checked several Scripophily organization web sites, none of which have had an update in the past 12 months.